A Canadian invention that improves indoor air quality and reduces a building’s energy costs turns ten years old this spring. 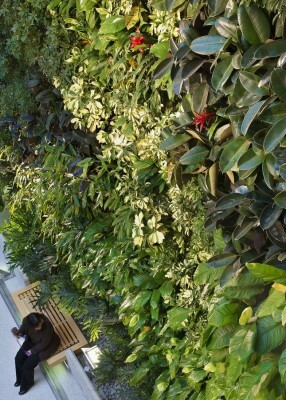 The living wall biofilter – an installation of tropical plants adorning office, academic, commercial and civic buildings – is a sustainable design response to create a healthy indoor environment and lower the carbon footprint. 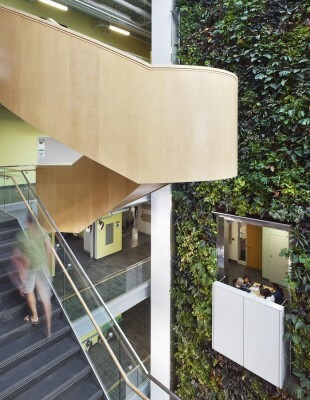 Developed by Dr. Alan Darlington and introduced commercially by Diamond Schmitt Architects at the University of Guelph Humber campus in Toronto, the success of the prototype launched NEDLAW Living Walls with its patented green technology and has generated dozens of collaborations between the two firms in North America. 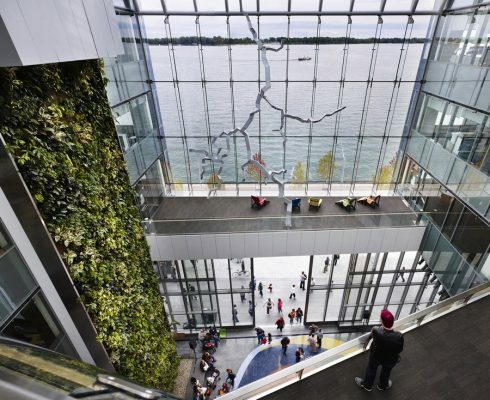 “We were looking for a way to feature biofiltration research undertaken by the University of Guelph for their Humber academic building a decade ago,” said Donald Schmitt, Principal, Diamond Schmitt Architects. The research showed indoor air can be cleansed of pollutants such as carbon monoxide, moulds and bacteria and Volatile Organ Compounds (VOCs) through exposure to the beneficial microorganisms on plant roots. Suspended in woven, porous material, the roots of these hydroponically grown plants breakdown these compounds and produce no toxic waste by-product. By connecting a living wall to a building’s HVAC system, the treated air is humidified and over 80 percent of indoor air contaminants are removed. The living walls designed by Diamond Schmitt Architects are typically between two to four stories high and integrated into a building plan at the schematic design stage. Their presence informs atrium orientation and skylight design to maximize the amount of natural daylight that reaches the plants. This attractive green feature becomes a focal point for gathering and is testament to the positive impact of plants on human health. Anecdotal evidence of living walls indicates improved productivity, reduced sick days and creating a better sense of wellbeing. Since the first living wall, Diamond Schmitt and NEDLAW have explored additional synergies with clients on the use of biofilters. “It’s particularly gratifying to see living walls become part of the curriculum in academic buildings where they are featured,” said Schmitt. Drexel University’s Papadakis Integrated Sciences building in Philadelphia has a new field of research in microbial root communities. 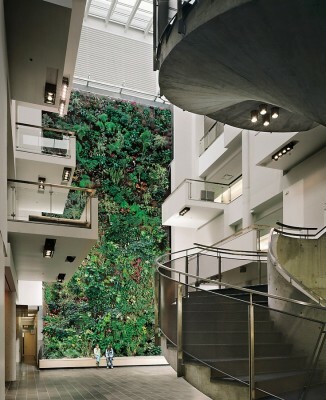 The LEED Platinum Algonquin Centre for Construction Excellence at Ottawa’s Algonquin College uses its five-storey living wall to enrich the study and practice of green building design. The first living wall at U. of Guelph Humber is growing strong today. Others are featured at Diamond Schmitt’s Cambridge, Ontario City Hall, Corus Quay office building and Centennial College Library in Toronto, at the Royal Botanical Gardens in Burlington, Ontario, and at Thompson Rivers University in Kamloops, B.C. The largest to date is a six-storey biofilter at University of Ottawa’s Vanier Hall. An office building and hotel under construction in Buffalo, New York will also include a four-storey living wall.